Home | Latest News | What’s All The Fuss About Kale? What’s All The Fuss About Kale? Everywhere you go, there it is. Fresh kale in the produce aisle. Kale in the serve-yourself salad buffet. Kale chips in the snack aisle. In fact, retailers predict that kale will be one of this year’s hottest food trends. Kale may be new to you, but it’s not new to the culinary scene. Health-promoting curly kale was one of the most popular vegetables in Europe before its star waned at the end of the Middle Ages. It went out of fashion for a while, but kale made a comeback during WWI when planting this easy-to-grow vegetable was encouraged as part of the Dig for Victory campaign in the UK. What is it about kale that has made it once again eclipse other wholesome greens like spinach and broccoli? Why has everyone from celebrity chef Jamie Oliver to movie stars including Angelina Jolie, Jennifer Anniston, Anne Hathaway, Woody Harrelson, and Ryan Seacrest made kale the star of their menu planning? When it comes to good-for-you eating, kale simply can’t be beat. This nutritional powerhouse offers everything you want in a leafy green. It’s loaded with vitamins A, C and K, and also supplies folate, potassium, and a hearty serving of calcium. Kale is low in calories,and you don’t have to eat a lot of it to enjoy the health benefits. That makes it a natural for celebrities (and everyday people) who are watching their weight but don’t want to sacrifice good nutrition on the altar of beauty. We eat with our eyes as well as our mouths, and kale’s lovely colours are visually delicious. The ruffle-edged leaves range in colour from cream to purple to black, depending on the variety. And when kale is cut into thin strips and marinated in a dressing, it becomes soft and juicy. 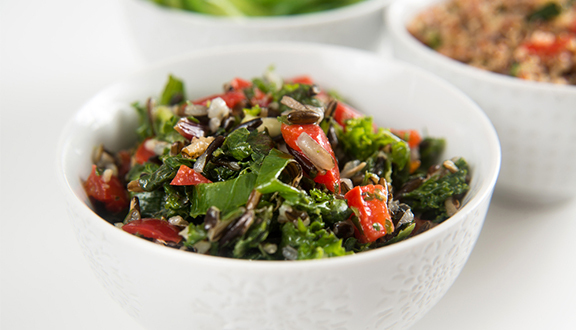 That makes kale a natural for the dermaviduals girls’ brightly hued Rainbow Kale Salad recipe.Since no cooking is required, none of the nutrition is lost, and you can whip up this recipe in minutes. Stack two of the kale leaves with the stem end facing you. Fold in half lengthwise and roll tightly like a cigar. Slice crosswise into thin strips. Chop the kale strips a few times, so they aren’t too long, and put them in a medium bowl. Add the lemon juice, oil, and salt. Toss well with your hands, working the dressing into the greens. Add the capsicum, pine nuts, and olives and toss gently. Season with ground pepper if desired. Stored in a sealed container in the refrigerator, your Rainbow Kale Salad will keep for 3 days. Just be sure to bring to room temperature before serving. We hope you enjoy it! Don’t forget to tell us what you think!